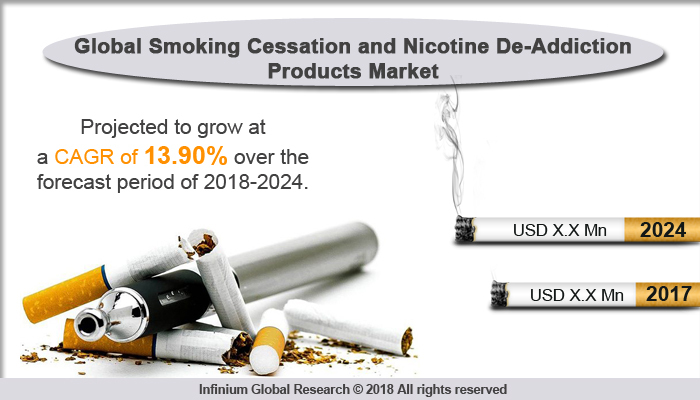 A recent report published by Infinium Global Research on smoking cessation and nicotine de-addiction products market provides an in-depth analysis of segments and sub-segments in global as well as regional smoking cessation and nicotine de-addiction products market. The study also highlights the impact of drivers, restraints and macro indicators on the global and regional smoking cessation and nicotine de-addiction products market over the short term as well as long term. The report is a comprehensive presentation of trends, forecast and dollar values of global smoking cessation and nicotine de-addiction products market. According to the report, the global smoking cessation and nicotine de-addiction products market is projected to grow at a CAGR of 13.90% over the forecast period of 2018-2024. Smoking Cessation and nicotine de-addiction is the process of discontinuing tobacco smoking. The habit of tobacco smoke over time can cause physical and psychological addiction. Tobacco contains nicotine, which is a chemical that is dangerous as it causes cancer as well as addicts a person to smoke. Tobacco smoke releases the neurotransmitters such as of as dopamine, glutamate and gamma-aminobutyric acid (GABA). Smoking is one of the major causes of lung cancer and other respiratory and cardiac diseases. Smokers who give up smoking before 35 years of age have similar mortality rates to those who never smoked. Tobacco and cigarette can be better treated with smoking cessation products. Factors such as growing consciousness among cigarette smokers regarding the health disadvantages of smoking such as lung cancer, cardiac diseases, and other respiratory problems have propelled the global cigarette cessation and nicotine de-addiction products. Initiatives assisted by governments to create consciousness regarding the harmful effects of smoking with the help of information brochures, warning labels, discouraging imagery on cigarette packages, television advertisements, and newspapers are also driving the growth of the market. There are also some non-government organizations working to help and educate the people to quit smoking and are constantly engaged in reducing the number of customers. This will allow the smoking cessation and nicotine de-addiction products market to increase during the upcoming period. Besides this, the accessibility of a large range of nicotine replacement therapy (NRT) products through retail and online selling platforms is also fuelling the market growth. However, on the flip side, less awareness regarding smoking cessation products in developing economies is hampering the market growth. Among the geographies, Asia Pacific region dominates the smoking cessation and nicotine de-addiction products market. Factors such as the growing number of smokers and rising consciousness about health hazards connected with smoking driving the market growth in the Asia Pacific region. In addition, Europe and North America region have significant market share owing to increased awareness and high disposable income to purchase smoking cessation and nicotine de-addiction products. The report on global smoking cessation and nicotine de-addiction products market covers segments such as type and distribution channel. On the basis of the type, the global smoking cessation and nicotine de-addiction products market is categorized into e-cigarettes, drug therapy, and nicotine replacement therapies. On the basis of the distribution channel, the global smoking cessation and nicotine de-addiction products market are categorized into a drug store, retail pharmacies, hospital pharmacies, and online pharmacies. The report provides profiles of the companies in the global smoking cessation and nicotine de-addiction products market such as Takeda Pharmaceutical Co., Ltd., Pfizer, Inc., NJOY, Inc., Imperial Tobacco Company of India Limited., Cipla Ltd., Revolymer PLC, Novartis International AG, McNeil AB, and GlaxoSmithKline PLC. The report provides deep insights into demand forecasts, market trends, and micro and macro indicators. In addition, this report provides insights on the factors that are driving and restraining the global smoking cessation and nicotine de-addiction products market. Moreover, IGR-Growth Matrix analysis given in the report brings an insight into the investment areas that existing or new market players can consider. The report provides insights into the market using analytical tools such as Porter's five forces analysis and DRO analysis of smoking cessation and nicotine de-addiction products market. Moreover, the study highlights current market trends and provides forecast from 2018-2024. We also have highlighted future trends in the smoking cessation and nicotine de-addiction products market that will impact the demand during the forecast period. Moreover, the competitive analysis given in each regional market brings an insight into the market share of the leading players. This report will help manufacturers, suppliers and distributors of the smoking cessation and nicotine de-addiction products market to understand the present and future trends in this market and formulate their strategies accordingly.